How To Delete Cookies And Cache To Load Internet Explorer Fast? Most of the Microsoft users know the reason for slow booting of their systems. But most of them don’t know the reason for the slow speed of the Internet Connection. It happens if the Internet Explorer browser has full of cache. You can make your browser clean just by following the steps. First, you should know about the Cache. It is the location where the browsers save the visited webpages. For example, if you will visit the www., the browser will save all of the images from the site. If you search for the next time, the cache will bring the saved images so fast. The cache should be cleared in order to keep your Hard Drive active and safe. Follow the simple following steps to make the browser active. • Right click on the Internet Explorer icon and choose properties or open the IE and go to menu bar and choose tools. • From the Tools menu, choose Internet Options. • Now go to the Internet Options window and then click on General Tab. 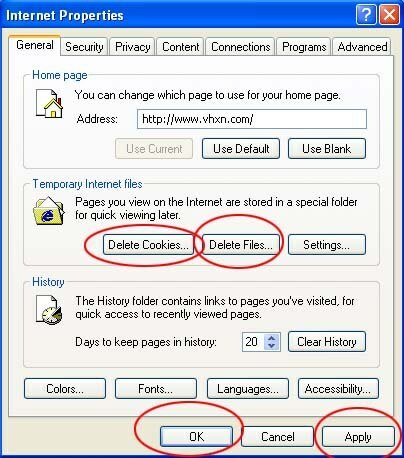 • Now in the second option, that is Temporary Internet files, click on the Delete Cookies button. This may clean the entire saved cookies and cache. • Now click on Delete Files button. Remember, you can delete all offline content from here. • Now click on the Ok tab. • Now click OK tab, in the Internet Options window. This is a simple tips but it is one of the finest ways to solve the slow speed process of Internet Connection.